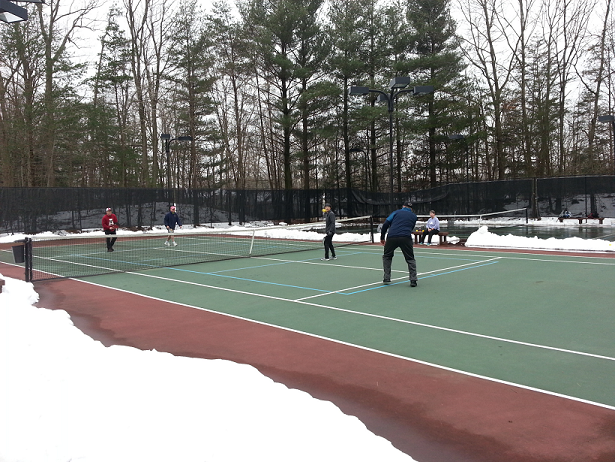 19 Jan 2019 - BCPA players don't let a little snow stop them from playing! 23 Jan 2019 - Look for your annual dues email; it will be coming soon. 25 Jan 2019 - The BCPA Discussion Forum is up and running! Registration is free. If you want to start a discussion category, you will get a message that this must be approved. Be patient with your webmaster on follow-up. Burke Centre Pickleball Association (BCPA) Charter was unanimously Approved by the Burke Centre Conservancy Board of Trustees. The Conservancy expressed their appreciation of our volunteers during the BC Festival. Conservancy has approved BCPA reservation for all four Landings Courts on Saturday morning. This is huge since there is a BC rule against this. 20 Feb 2019 - BCPA has purchased 3 buckets of balls with first aid kits and distributed them to regular players. No longer dependent on that one guy bringing a bunch of balls. BCPA has joined Meetup.com to provide a means for players to communicate and schedule their own times to play outside of our scheduled times. There are discussion boards where to can ask questions, make suggestions, get rules clarifications, post photos, etc. 30 Mar 2019 - Andy Forsyth ran the first of several clinics he hopes to run during our normal Saturday play time. You can read his instructional notes.